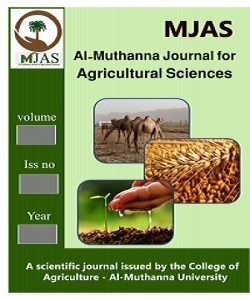 Study of some characteristics of fruits and enzymatic activity Invertase ,cellulose and respiration rate for strains of the date palm seeded planted in the Basra region . This study was conducted on the cultivars seed quest cultivars in the province of Basra to identify the characteristics of these cultivars have been studied effective enzyme for the enzyme invertase and cellulose and respiration also been studied characteristics of wining and some of the characteristics of the quality of the fruits have shown results than type of number (33)significant for the other cultivars of the study has recorded the highest values (12934)Unit/Kg/min for the enzyme product invertase either a number (1)has recorded less than values (8072) Unit/Kg/min.As for the enzyme cellulose was of the cultivarse of number (33) moral superiority for the rest of the items was recorded (2559) Unit/Kg/min.And that the product of a number (15)had a little less recorded (1071) Unit/Kg/min.The product of a number (29)gave the highest values in the respiration ,which was (46.19)mgCO2/Kg/ hour .while the product of a number(1) gave lower values of respiration was (23.01) mgCO2/Kg/ hour . It was found that there are many cultivars of good qualities and not less than cultivars أجريت هذه الدراسة على بعض الأصناف البذرية المهمه لنخيل التمر المزروعة في محافظة البصرة للتعرف على الصفات المميزة لهذه الأصناف وقد تم دراسة الفعالية الأنزيمية لإنزيمي الانفرتيز والسليوليز والتنفس كما تم دراسة صفات الحاصل وبعض الصفات النوعية للثمار وقد بينت النتائج تفوق الصنف ذي الرقم (33) معنويا عن باقي الأصناف الداخلة بالدراسة وقد سجل أعلى قيمة (12934)وحدة/كغم/دقيقة بالنسبة لإنزيم الانفرتيز أما الصنف ذي الرقم (1) فقد سجل اقل القيم. ( 8072) وحدة/كغم/دقيقة. أما بالنسبة إلى انزيم السليلوليز فقد كان للصنف ذي الرقم(33) تفوقا معنويا عن باقي الأصناف وقد سجل( 2559) وحدة/كغم/دقيقة. وان الصنف ذي الرقم (15) كان له اقل تسجيل يذكر(1071) وحدة/كغم/دقيقة. وقد أعطى الصنف ذي الرقم (29) أعلى القيم في التنفس والتي كانت (46.19 ) ملغمCO2/كغم/ساعة.أما الصنف ذي الرقم(1) فقد أعطى اقل قيم التنفس (23.01 ) ) ملغم CO2/كغم/ساعة. وقد أظهرت النتائج بان هناك كثير من الأصناف ذات صفات جيدة ولا تقل جودة عن الأصناف المعروفة .